The kind of siding on your home should accentuate the character and design of your home. For example, you wouldn’t install vinyl siding on a Victorian home, but misguided homeowners do it. Nor would you expect to find expensive redwood on a home exposed to the elements of the sea, but builders often cater to those with more money than common sense. When home shopping — whether you are a first-time home buyer or veteran — pay attention to the condition of the siding. It’s expensive and time-consuming to replace or repair siding, costing anywhere from a few dollars to $30 or more per square foot. The lifespan of various types of siding will depend on the climate where you live. Home siding can require periodic painting or restaining and, in the event of wild temperature swings, some types of siding can crack through expansion and contraction. Little spruces up a home and changes its desirability more than new siding. New siding offers a benefit to home buyers because it extends the life of an exterior. Adding insulation under siding provides a moisture barrier and prevents outside temperatures from disturbing the balance of interior climates. The life expectancy of, say, a new paint job is at least five years, and quality paints are touted by manufacturers to last 10 to 20 years. New siding requires little, if any, maintenance. Brick can last a century. Because it’s made from fired clay, brick doesn’t burn and is not susceptible to dry rot. If the brick is not part of your original structure, then adding brick is typically accomplished by installing a brick veneer, also known as the brick face, which are not full complete brick blocks. Maintenance of actual brick involves repointing; that is replacing mortar in between the bricks. Mortar is a mixture of cement, water, lime and sand. Stucco can be applied by a variety of methods, but hand-troweled is considered to be the best. It can be smooth, rough or somewhere in between. Stucco needs to be water tight. If water seeps under the stucco, it will separate the material from the home. In a virgin application, stucco is spread over wire mesh, wood slats, paper, and sheathing. Like mudding, drying in between coats is recommended. Re-stuccoing is permissible over original stucco. Vinyl siding is made of PVC or polyvinyl chloride and comes in a variety of colors. The panels are installed from the bottom row up by nailing galvanized roofing nails through the slots in the panel, exposing the nail head so the panels can move. The vinyl expands and contracts in hot and cold weather and must slide freely from side to side. Two main advantages to vinyl are it’s inexpensive and never needs painting. Wood siding is manufactured in a variety of types such as shake, clapboard, singles or lap. Panels are applied vertically or horizontally, and finishes range from stains to paint to sealants. Wood siding should be installed over a moisture barrier, and some contractors suggest priming the back of the wood and its sides to prevent water from seeping into the wood. Although wood is beautiful, it requires maintenance and can rot. Covering the exterior of your home with log siding can make it look like a log home without rebuilding the home. Log siding comes in quarter logs and half logs. The finishes are smooth, knotted or, for that authentic log-home appearance, hand-hewn. Some log siding isn’t even wood, but resembles wood and is available in vinyl or steel. Common wood choices for log siding are pine or cedar. Glass block walls are non-load bearing. They are laid by installing panel anchors to the jambs; expansion strips around the opening and panel reinforcing wire stabilizers every third or fourth row. Blocks are set into a special mortar made for glass. The maximum recommended size of a glass block wall is about 20 pounds per square foot or 144 square feet. I have a glass block wall in my home, which lets in light, but it does show interior shadows from the street. Routine exterior caulking is suggested. Manufactured siding can be created from almost any material and made to resemble natural wood. Some composite siding is made from shredded wood, binders, glue and Portland cement. James Hardie is a well-known manufacturer of fiber-cement products — built to withstand rain, wind, hail and insects — and this siding is available in a variety of colors, boasting a limited 50-year warranty. Habitat for Humanity builds many homes with HardiBoard. Stone has been used for centuries. Today’s stone siding products are natural or simulated. Artificial stone faces are lighter and easier to install. Of all the siding options available, stone siding is the most expensive. Most applications support a first layer, which is wall sheathing, covered by a waterproof paper on top of which metal lath is secured. Then the stone is set into the mortar and laid. I can imagine how changing the siding of a building can drastically change the appearance. I never considered these other benefits like lower utility and maintenance costs. 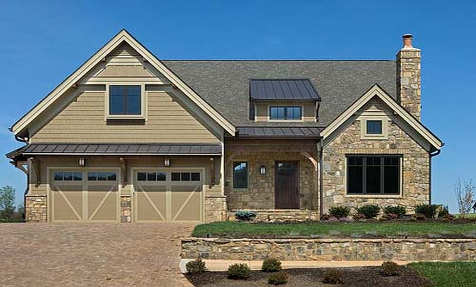 I think stone siding is the best looking and love all of the different patterns and colors that are available. My husband and I have decided that we want to get a custom home built. I like how you point out that there are several different types of siding that have different functions. It’s interesting to learn that siding vinyl can expand and contract in hot and cold weather and will slide freely from side to side. It is also inexpensive and doesn’t need painting. We are very low maintenance people, so having something like this sounds like a great option for us. I prefer brick, but for our next house we will choose vinyl because it has more variety and designs to choose from. I didn’t know that there were so many choices for home panel siding. This is going to help my fiance and I a lot as we look into getting new siding for our new home. We like composite siding since it will look like real wood. I did not know there were so many different options for siding! This information will be very helpful while we look for siding for our home.